We Indians celebrate almost everything……..we have celebrations for spring, summer, harvesting, the monsoons, for full moon nights, for moonless nights, for love, for growing old, birth, weddings, birthdays, and the list goes on and on. Since the Hindu religion allows us to see God in anything….we have a multitude of Gods as well….though the Vedas(the Holiest of all our sacred texts stipulate that they are all one)…and all these Gods have gazillions of epics written about them….so we celebrate days that they triumphed over evil, their earthly births and other note worthy incidents. Raksha Bandhan is the festival where brothers and sisters celebrate their love for each other. Sisters are required to tie an ornate band around their brother’s wrists…something like a friendship band……and in India we call them Rakhis. 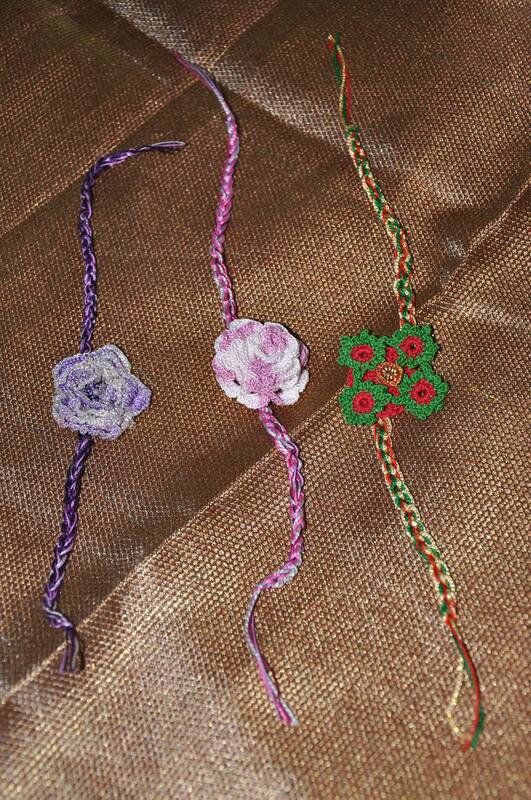 These are the Rakhees, that were made by me last year….and I followed the pattern in the link below to make the motif. The motif can be found on page 49 and 50. For the tie up ..I simply got gold, green and red yarn and braided it together, tying knots at each end to hold the braid in. I also crocheted a square base so that you can see the red peeping thru the gaps in the motif and started the first circle with matt coloured beads. 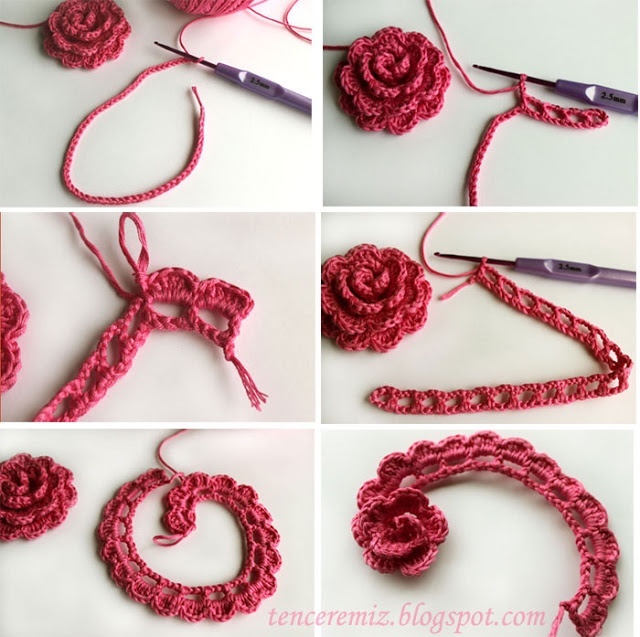 Here again the pattern is of a 3 layered rose…taken from page #61, from the link above. I sewed in the beads here and made the tie on exactly as I did above. Used DMC#8 and a .90mm hook. Here, the centre piece was crocheted according to the pattern found in this blog…. Used variegated Anchor cotton#20 and a 1.25 hook.